In his last four fights, Manny Pacquiao hasn’t looked like a guy who deserves a shot against Floyd Mayweather Jr. If you accept the general premise that Mayweather is currently the best pound-for-pounder in the world today, then it’s only natural to assert that his next opponent should be someone who is nearly as great. Over his past four fights, Pacquiao is 2-2. He beat Shane Mosley, lost (*) to Timothy Bradley, and split a pair with Juan Manuel Marquez. Beyond the Ws and Ls, though, he looked bad in all those bouts. Mosley spent the entire fight running away from him, and despite his speed advantage, Pacquiao just couldn’t seem to take him out. Bradley was badly hurt early in his fight with Pacquiao, however, the Filipino star just couldn’t finish him off – leaving himself open to that ludicrous decision. Against Marquez, in their third match-up, Pacquiao looked slow and lethargic; he lost the fight on a lot of peoples’ scorecards. Then, in their fourth fight, we all know what happened. 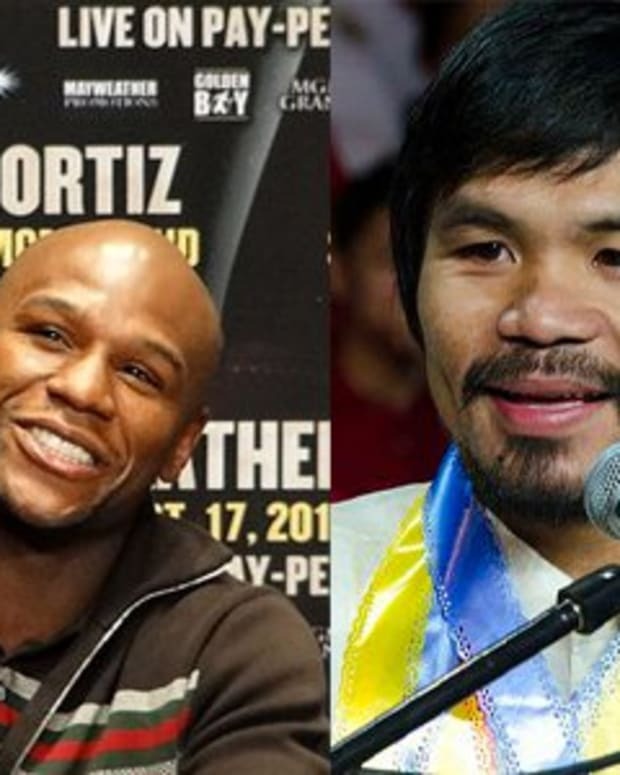 Bottom line: if the criteria for facing Mayweather is being at the top of your game, Pacquiao currently fails to qualify. Fortunately, that’s obviously not the criteria. Mayweather has fought the likes of Mosley, Robert Guerrero and Victor Ortiz when they were nowhere near the top of boxing’s pound-for-pound charts. Saul ‘Canelo’ Alvarez was the exception, not the rule. Because of that it stands to reason that, should Pacquiao get past Brandon Rios this November, he should get a shot at Mayweather in early 2014. Apparently he feels the same way. Recently, Pacquiao sent out his mouthpiece, Michael Koncz, to do an interview with World Boxing News. As usual, Koncz planted the seeds with the media that Pacquiao wanted him to plant. When pressed on whether his guy would push for the match, Koncz was relatively standoffish. Despite all the rumors about him fighting Amir Khan early next year, nothing has been finalized yet. 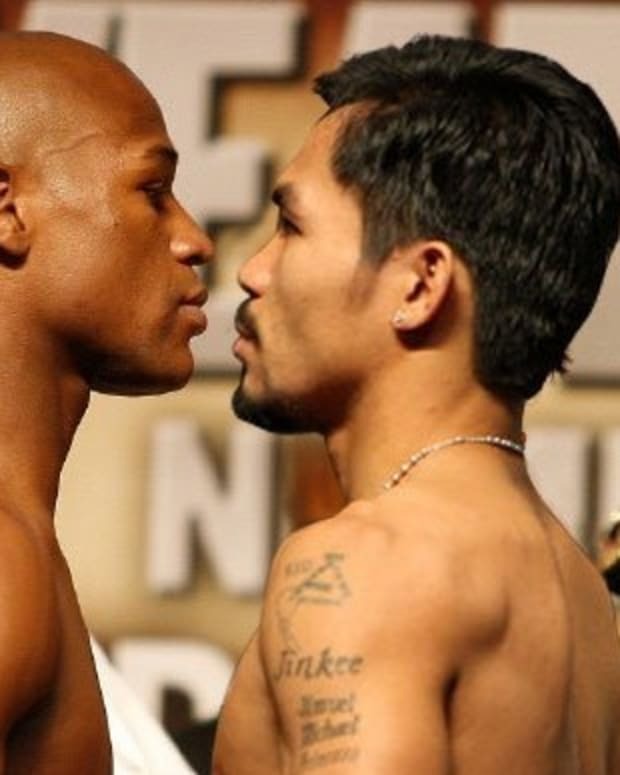 Mayweather is smart enough to know that a bout against Pacquiao would obliterate the numbers one with Khan would do. Along the same lines, he knows that 34 is a higher number than 26. 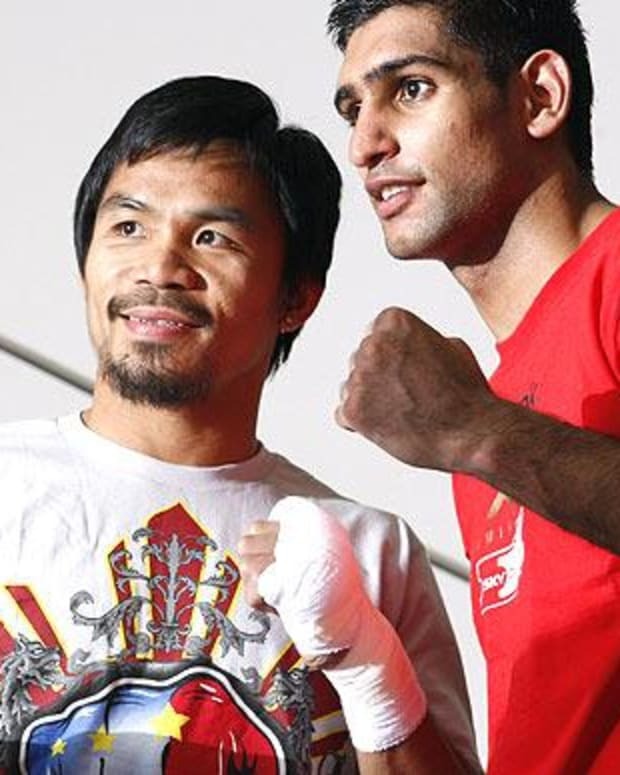 Khan will still be here a year from now, Pacquiao most likely will not.